People who do not read ‘esoteric’ or mythology related books will probably not be aware of the numerous strange artifacts and puzzling structures that can be found all over the world. I would here like to present some of these to the visitor, without too much of my own interpretation. An escape route for the soul of the King? Megaliths - Markers of the Gods? The photograph in Figure 1 below shows some of the 65 charcoal stencils of human hands discovered in the Cosquer cave in southern France. Other images in the cave include 187 of animals and numerous geometric signs in various shapes. 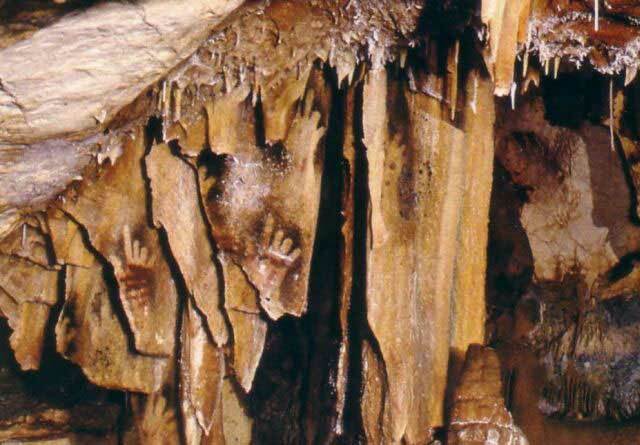 Small handprints of children had also been found in the cave, and a child must have been lifted by an adult to make a handprint on the rock surface 2.2m from the ground. 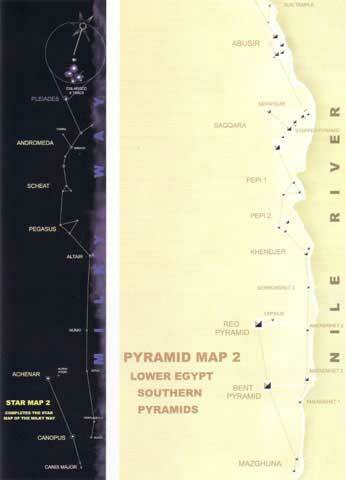 The images have been dated to between 27 000 and 19 000 BCE. Similar images dating back to that period have also been found at the Chauvet cave in southern France, including images of mammoths and woolly rhinoceroses. The cave seems to have been used as a source of calcium carbonate for medicinal purposes, but also as an art gallery as the images would be protected from the elements. 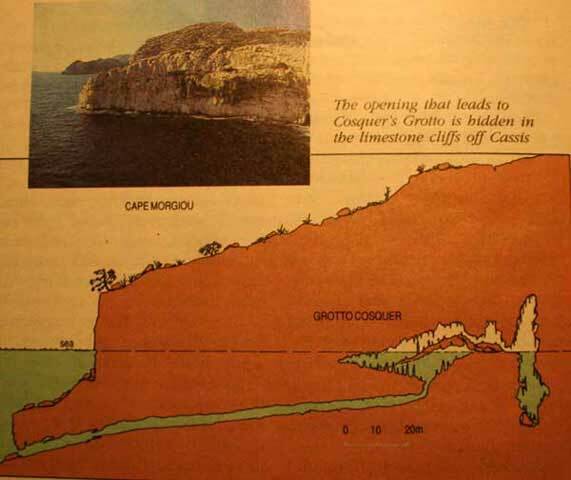 Incredibly, though, the entrance to the cave is 37m below sea level (Figure 2), suggesting that human beings existed long before the Ice Age. In terms of my theory about a comet strike at the Scotia Plate, could the European continent have been forced downward by the impact? 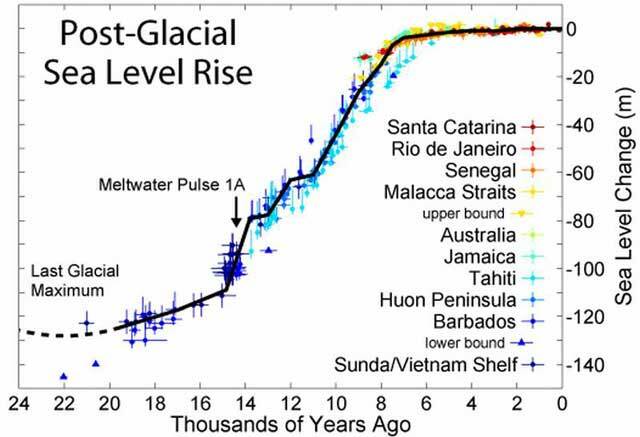 A graph of the rise in sea level over the past 24 thousand years (Figure 3a below) shows that the sea level was below -40m with respect to the present level up to about 10 000 years ago, or 8 000 BCE. This confirms that the Cosquer cave paintings date back many thousands of years and that the dated period of 19 000 BCE is indeed possible. Another contentious underwater site was discovered near the Japanese island Yonaguni , which according to some represents an ancient underwater temple, but to others is nothing but natural geological formations. If man-made, it would likewise suggest the presence of a human civilization thousands of years before what is generally accepted. Figure 3c. 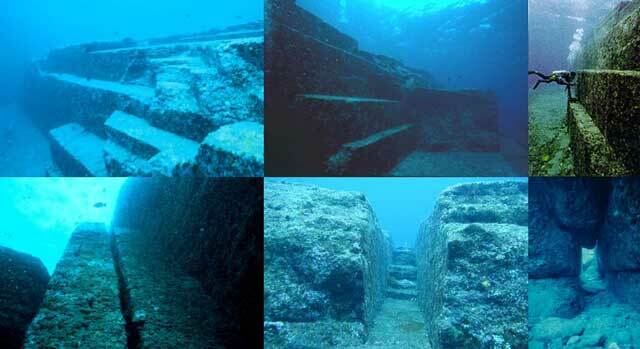 Yonaguni underwater site – natural rock formations, or man-made? In 1994 Robert Bauval together with Adrian Gilbert published his book The Orion Mystery in which he claimed that the layout of the Giza pyramids represented the Orion constellation in space. This theory caused quite a stir amongst Egyptologists but it was not long before the theory was debunked and it now seems to be forgotten. 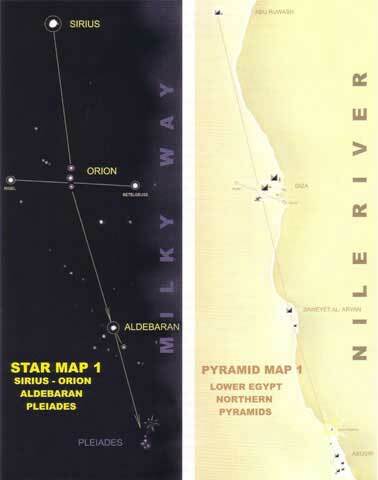 The principal counter argument was that the correlation between the Giza pyramids and the Orion constellation was not perfect (see image below). 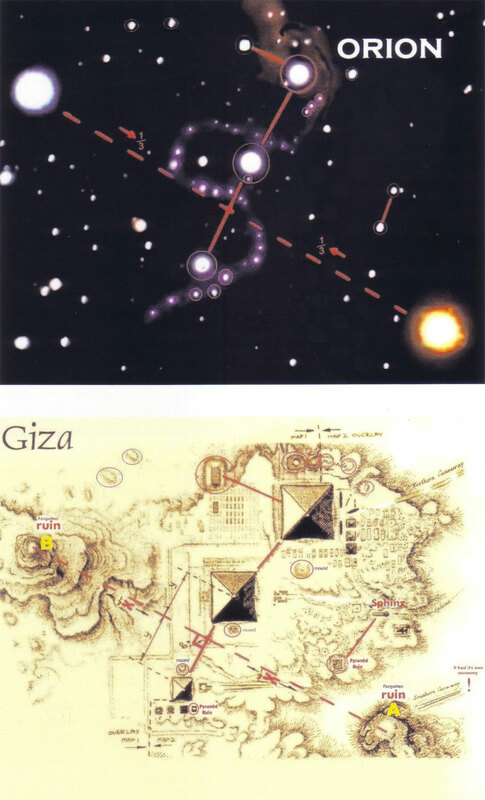 In his book The Hidden Records, Wayne Herschel expanded the ‘mapping of the heavens’ idea substantially and managed to align in the order of 30 or more pyramids with corresponding visible stars in the heavens. 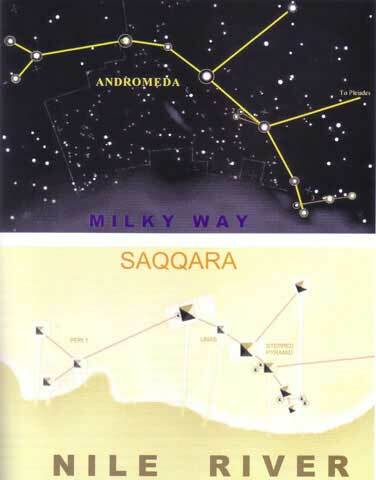 Some of his maps are shown below. 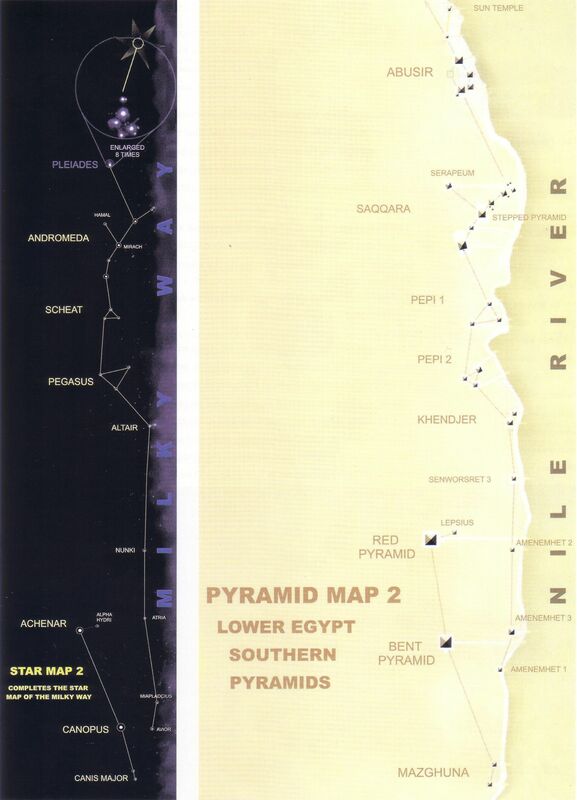 These demonstrate that the mapping of the pyramids to corresponding stars was not perfect, but that there may indeed be a correlation between the pyramid locations and the corresponding stars. 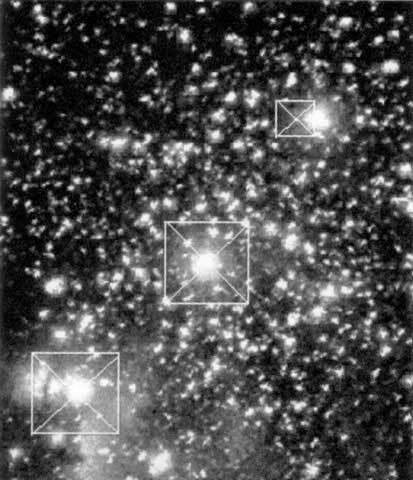 Herschel presents several other ‘star maps’ which the reader may find interesting. 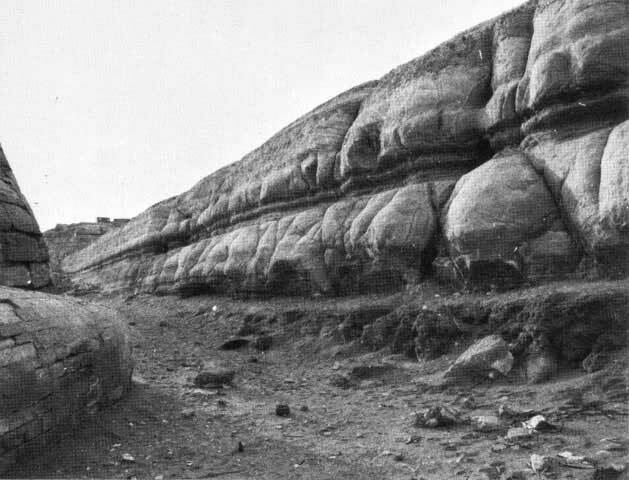 Much has been speculated about the age of the Sphinx in the Giza complex, specifically following the conclusions of Lubicz, West and Schoch, that the erosion of the walls of the Sphinx could only have been caused by prolonged and extensive rain (see image below). This theory has been rejected by Egyptologists in general as it would otherwise suggest that the Sphinx was built long before the era of the First Dynasty (3000 BCE). Egypt (the Sahara) experienced significant rainfalls up to about 6000 BCE, so the Sphinx would have had to be constructed prior to or during this time frame. Every conceivable alternative form of weathering has been proposed, but even to the layman it should be obvious that this type of corrosion could only have been caused by significant rainfall. 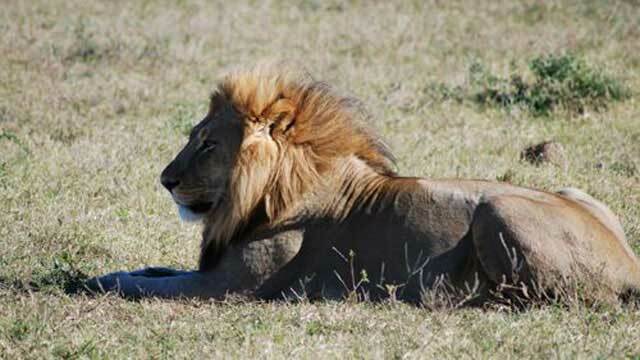 Another characteristic of the Sphinx that suggests a much older age is its size of the head (see images below). There appears to be little doubt that the body of the Sphinx is that of a lion and one can reasonably assume that the original structure would have represented a lion in full. Given the size of a male lion, the Sphinx may have been carved from a huge outcrop of limestone, which became deformed because of thousands of years of wind erosion. Could the Egyptians really have had such an appalling sense of proportions? 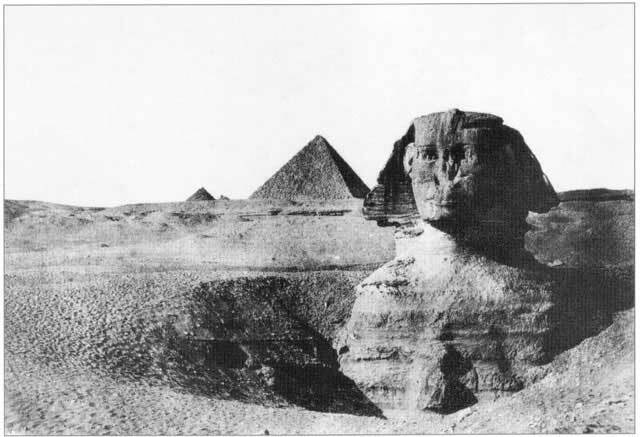 The body of the Sphinx had been covered by sand for most of its existence, as confirmed by this photographs dating back to 1849 and 1867, respectively. 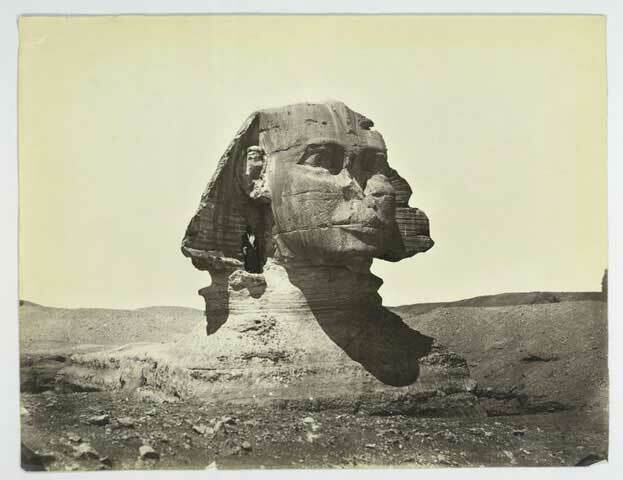 These photographs suggest that the body of the Sphinx had remained protected for probably thousands of years, while the head would have been exposed to wind erosion all this time. If the head of the Sphinx had indeed been exposed to thousands of years of wind erosion, practically all its features would most likely have disappeared. It appears logical then that at some stage an Egyptian pharaoh had decided to carve his own image into the featureless protrusion that remained above the body of the Sphinx. 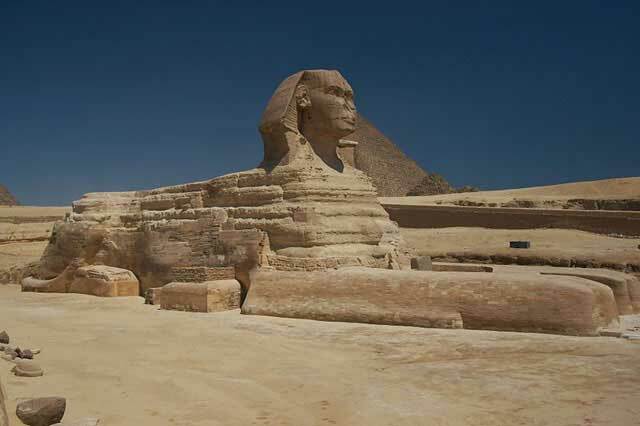 Thousands of years of wind erosion again implies that the Sphinx dates back to long before 3000 BCE. Tuthmosis IV supposedly came to power because the Great Sphinx of Egypt promised him, in a dream, that he would become king should he restore the Sphinx’s ruined body. Tuthmosis erected a carved stone tablet, now known as his Dream Stele, between the paws of the Sphinx, either before restoration started, to justify himself having usurped power, or after restoration had been completed. At the top of the Dream Stele we find mirror images of a Sphinx which one can assume to be the shape of the Sphinx that Tuthmosis had in mind (where else would this shape have come from?). From what is visible today, it would seem that he had not been able to complete the restoration of the Sphinx. 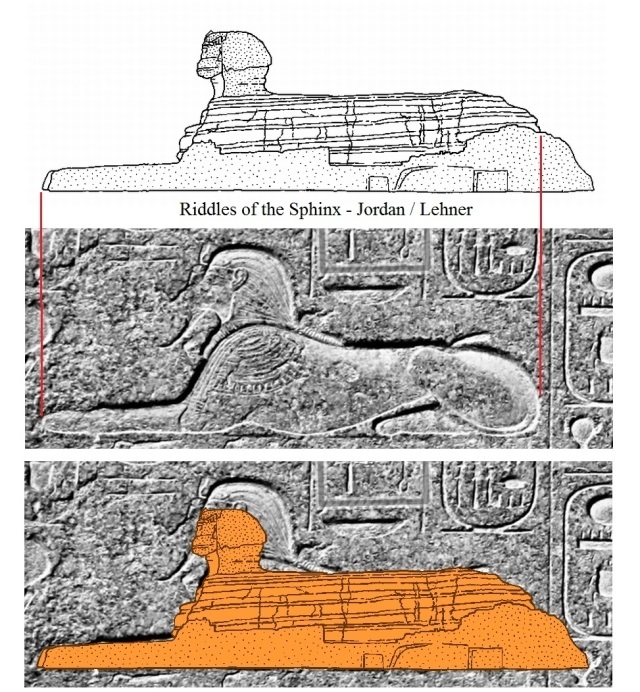 Figure 15a shows an overlay of a drawing of the Sphinx’s current shape and the Sphinx relief on the Dream Stele. The current shape and size of the head is significantly different from what appears to be its original form. In other words, the original head of the Sphinx must have been significantly higher and bigger, but most likely lost its facial features and overall size due to wind erosion over hundreds if not thousands of years. At some point a pharaoh named Khafra then decided to re-carve the head in his own likeness, or in other words, the Sphinx existed a long, long time before the Old Kingdom. Do you agree?